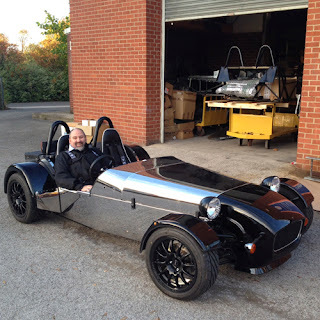 Bill's Zero Build: It's passed the IVA ! Well its been a few weeks since I last posted a blog. Been busy with house work, gardening before the weather turns, decorating the spare room, building wardrobes, fitting new wooden blinds to the front windows, going away for a few days, and several visits to the local Hospital only to be told that I now have to go onto Insulin injections... damn. Forgot to put some trim on the cut out on the bonnet for the exhaust, For some reason the rear fog light switch did not illuminate when pressed... it had worked before I recessed it in the panel, think I knocked a wire off re-fitting it and failed to re-test. Had a low coolant problem, didn't notice this when I got the engine up to temperature but it was an air lock in the system. Throttle cable needed re-routing and after now returns to "tick-over" properly. I had also put a normal washer along side a spring washer on some of the bolts, the IVA tester doesn't like this, so these had to be changed to just spring washers, or normal washers with a Ny-lock nut. Setting up the speedo, had no instructions on this bit, but it was minutes to adjust by simply pressing a button and going through the menu settings on the speedo. Finally the low brake fluid switch was not working, bit annoyed with this as it was a brand new item ? The old switch, which was pretty dirty and old was swapped with the new switch and it all worked well, unfortunately it needed re-wiring which added to the labour bill. So all in all not many modifications to be done, plus the usual changes that GBS do for the IVA, such as extending the front indicators to the correct measurements, adding side a rear mirrors, changing the steering wheel to the large padded Sierra one, and other things they know about. 1) Fitting the boot cover, Having seen Simon at GBS fit one, he made it look easy ? I tried to fit the "press studs" with a hammer and punch and failed ? easier for Simon to do it ! 2) Fitting the rear diffuser, simply a lack of space in the garage, and getting access under the car to fit it ? I seem to have knackered my elbow building the Zero and it doesn't seem to bend very well now, and getting the rivnuts in under the car with limited access seemed too much effort, GBS said its an hours job, so to avoid lots of bad language while under the car all day on a cold floor it was a "no brainer" for them to do it. 3) Geometry set up. I've not got the equipment and measuring kit to set up the geometry of the car properly. So ride height, tracking, camber, Tyre pressures, damper settings etc where all set up by GBS. Instead of guessing all these settings and messing around adjusting for hours, and possibly getting frustrated when things go wrong it was another "no brainer"! 4) Registration and paperwork... they do it all the time, and I want it correct first time so I can get the plates on and have some fun ! So picked it up from GBS 2 weeks ago, and had a careful drive home, I had borrowed some trade plates just for the drive home, 2 items raised while driving back... the nearside repeater indicator failed ? was working earlier ? and then the speedo stopped working ? will investigate these in the next couple of weeks, think it might be a loose wire or connector for the indicator and an issue with the speedo sensor ? Will report back in the next blog on these. So now just waiting on the DVLA for my V5 form and tax disc.